Got this at lvl 60, still have it at lvl 50. Very good compared to the other quest reward alternatives. Speed is perfect for a BM hunter doing auto/steady shot rotation. I am but I still replaced it with this. Pretty easy to get, too. This quest will probably be on your "to do list" when you get to Terrokar: 63-65 ish. Yet both these weps have a whole 4.4DPS less than this one, which you'll probably get around 60-62. Unfortunately as of Cataclysm this reward was removed from the game. It is no longer obtainable. The change was made to accompany the change of Garrosh as Warchief of the Horde. 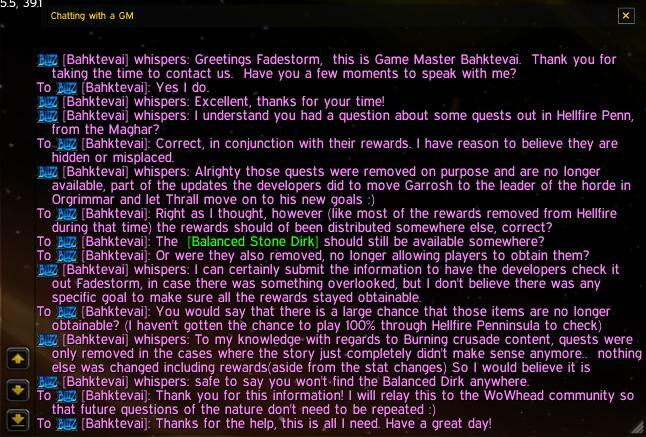 Here is the Gamemaster chat I had as confirmation of this change.